This show was broadcast August 11, 2009. Tuesday, August 11th: Jonathan Mark, one of our best 9/11 truth activists. Here is his latest essay describing his perspective as a peace-in-space activist turned 9/11 truth-seeker. Many 9/11 truth-seekers aren’t aware of the evidence that one of the primary motives of 9/11 may have been to accelerate the militarization of space–evidence explored in the section entitled “Missile Defense and a Space Pearl Harbor” of David Ray Griffin’s The New Pearl Harbor (p.96-101). Top space-war hawks Donald Rumsfeld, Gen. Richard Myers, and Gen. Ralph Eberhart are all near the top of the list of 9/11 suspects, and the Rumsfeld Commission had earlier called for a “Space Pearl Harbor” to galvanize the nation into supporting the militarization of space. Visit his website here. Deadline for emailed questions is 9pm Pacific Time, Monday, August 10th. Not all emailed questions will be answered on the air. 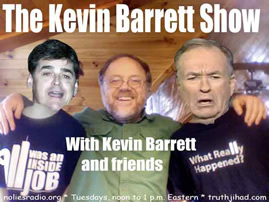 This entry was posted on Tuesday, August 11th, 2009 at 11:19 am	and is filed under 9/11, Anti-War, False Flag/Fake Terror, Kevin Barrett, News, Protest. You can follow any responses to this entry through the RSS 2.0 feed.